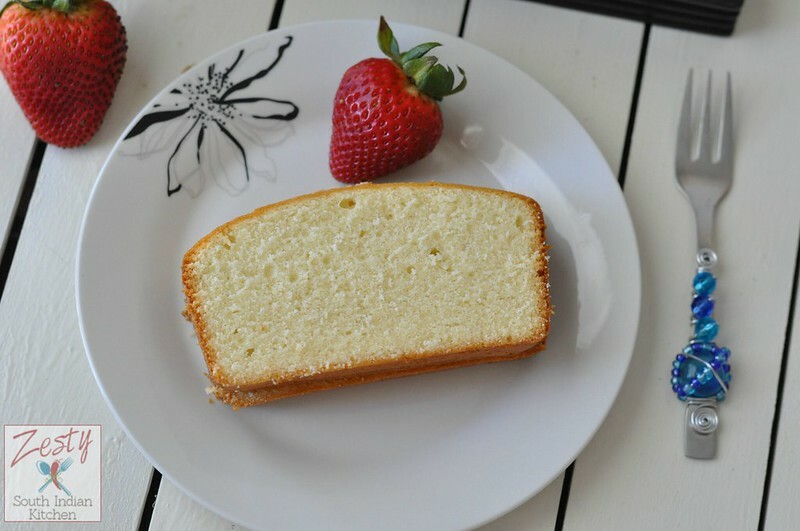 Delicious simple vanilla pound cake goes well with any fruit or dollop of whipped cream. I came to know about Elvis late in my life, however in India we have an old actor who copied Elvis style and was famous there, none other Shammi Kapoor. There is also a famous song starts with the Yahoo starring Shammi. For this month baking partner’s challenge we are going to make Elvis Presely’s favorite vanilla pound cake. When I asked what recipe they want to see in next challenge, baking partners asked for a pound cake. So I made this simple vanilla pound cake. It is really delicious. Normally I am afraid of pound cake. Pound cake refers to a type of cake traditionally made with a pound of each of four ingredients: flour, butter, eggs, and sugar. However, any cake made with a 1:1:1:1 ratio of flour, butter, eggs, and sugar can call itself as a pound cake, as it yields the same results. Pound cakes are generally baked in either a loaf pan or a Bundt mold, and served either dusted with powdered sugar, lightly glazed, or sometimes with a coat of icing. Pound cake is a favorite of Southern cuisine. Coming to this Elvis Presley’s favorite vanilla pound cake, it was made by his childhood friend Janelle McCombone. She makes two loaves every Christmas for him. Elvis would finish one loaf by himself. She gave the recipe on his 10th death anniversary to a local newspaper. 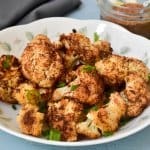 When I saw the recipe I got immediately hooked. It has everything that a pound cake needs along with one best thing heavy cream. I made little modification to the recipe. I reduced ½ cup of sugar and also increased the amount of vanilla extract. One more thing about the pound cake is that it is dense and has no leavening. 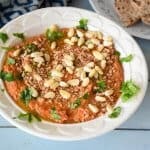 Goes well with fresh fruit and dollop of whip cream, and if you have any leftovers you can toast them little bit like bread and enjoy that too delicious. I didn’t add any syrup or glazing as I thought it will become sweeter. If you want you can add glaze and syrup of your favorite choice. If you want to make your pound cake summer or springy you can add lemon zest, lemon juice or any other citrus which you like. I found the simple pound cake itself delicious that is why it became the favorite of the King of Rock and Roll. Give it try you will love it, please visit rest of baking partners for variation of pound cakes. 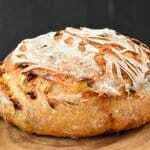 If you are interested bake with us next month shoot me an e-mail at favorite recipes12@Gmail.com. 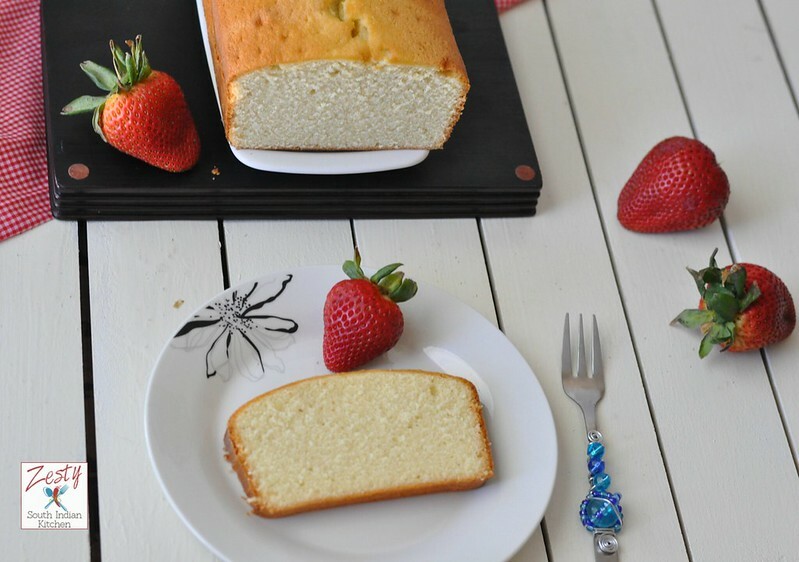 Delicious simple vanilla pound cake perfect with any kinds of fruits. Generously butter pan and dust with flour, knocking out excess flour, line the bottom of the pan with parchment paper. Once you sifted the homemade cake flour for 5 times, then add salt and sift together once again. If using cake flour then you need to sift only 3 times. at medium-high speed until pale and fluffy, about 5 minutes in a stand mixer fitted with paddle attachment or 6 to 8 minutes with a handheld mixer. Add eggs 1 at a time, beating well after each addition, For 1/2 egg ( beat one egg in separate bowl, and add 1 1/2 tablespoon of egg to mixture, 1 large egg is about 3 tablespoon,so use only half of it for half egg). Reduce speed to low and add half of flour, then all of cream, then remaining flour, mixing well after each addition. Scrape down side of bowl, and then beat at medium-high speed 5 minutes. Batter will become creamier and satiny. Transfer the batter into pan and tap the pan against work surface once or twice to eliminate air bubbles. Place pan in (cold) oven and turn oven temperature to 350°F. Bake until golden and a wooden pick or skewer inserted in middle of cake comes out with a few crumbs adhering, 1 to 1 1/4 hours. Cool cake in pan on a rack 30 minutes. 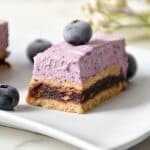 Run a thin knife around inner and outer edges of cake, then invert rack over pan and invert cake onto rack to cool completely. I never knew that vanilla pound cake was Elvis’s favourite. With such a delicious preparation it must be favourite of many celebrities. Woww.. this cake looks fabulous. so dense and moist..
Lovely vanilla pound cake, looks so yummy. 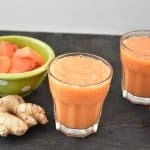 This looks delicious Swathi! Pinned and shared and hope it was okay to link my Pound Cake too! Hope to see you and your delicious recipes on Saturday! wow!It really looks delicious and spongy! This pound cake look too delicious.Hard to resist ..
Looks so nice and dense! super yummmy slice,love pound cakes!! I didn’t know this pound cake and has been a success at home. Thanks for the recipe. Yours looks beautiful and moist. Cheers. Good night! perfectly made pound cake!! looks so soft!! This looks super soft n awesome… Bookmarking it..
Cake looks soft and yummy. Delicious looking pound cake! I can see pouring some warm berries on top. YUM! Outstanding cake. so soft, moist and well clicked step by step pics.. 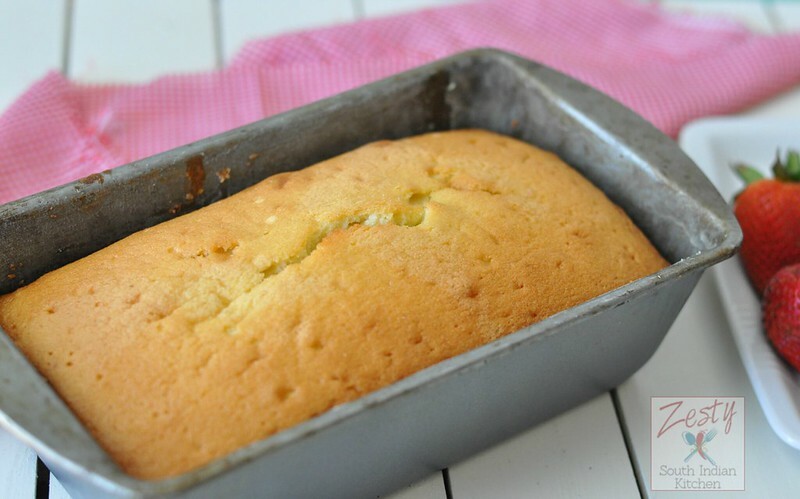 Pound cake looks soft and delicious, perfectly baked! 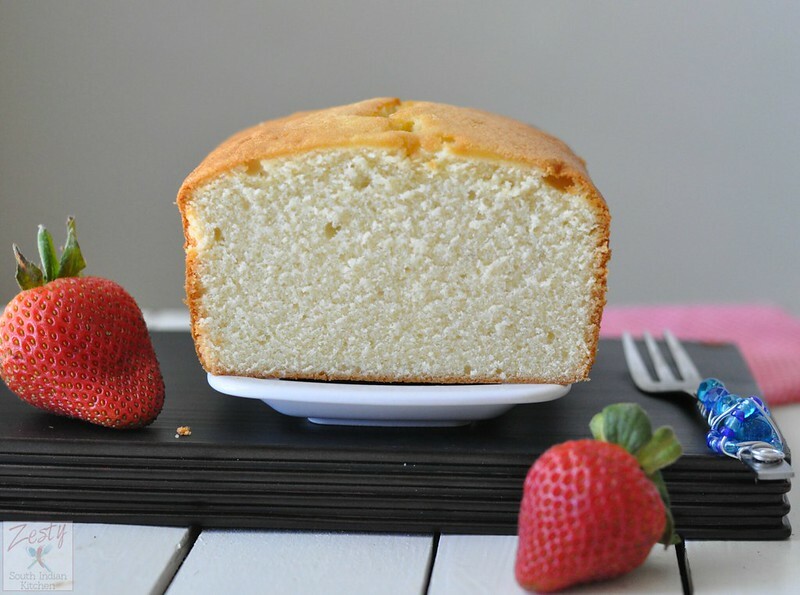 Love the beautiful dense texture of this pound cake! I can’t believe he ate a whole loaf by himself! This is perfect with all the fresh berries we have now.